Good gracious! 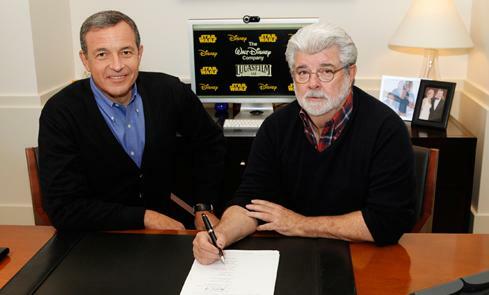 Disney has just acquired Lucasfilm for a cool $4.05 billion. But that's not the only bombshell that Disney announced today. Another one is the confirmation of Star Wars Episode 7's release date on 2015. Additionally, Disney also mentioned that they are planning to release new Star Wars movies every two to three years so it looks like we have a new trilogy on our hands. The announcement was made by Bob Iger himself over a 5-minute video (which you can watch after the break). The acquisition, in our opinion, bodes well for the Star Wars franchise. Disney has acquired Pixar (in 2006) and Marvel (in 2009) and we all know how things turned out for those two. Disney is also capable in showing more mature films like "The Pirates of the Caribbean" franchise, "John Carter", a bunch of Marvel superhero films like "The Avengers" and that's the only tip of the iceberg. Unfortunately for fans awaiting the 3D re-release of Episode 2 and 3, no confirmation was made on the status of both remakes.